A lot of what we do on our computers goes through the browser, and that means any extensions you choose to add on top of that browser have a very privileged position: They can see where you’re going online, they can see the data you’re passing to and from the web, and they can send and receive data themselves. With that in mind, it’s essential that the add-ons you install are ones that you trust—most extensions are built and coded without malicious intent, but there are always going to be bad actors out there. As well as keeping the number of extensions you use down to an absolute minimum, you should also make yourself aware of what these extensions have permission to do. Just like apps on your phone, browser add-ons have to be granted permissions, which are usually displayed when you install them. Most of the time there’s no granular control over these permissions—you either accept them or don’t install the add-on. These permissions will often include accessing your bookmarks, browsing history, and the data on websites you access. In the majority of cases these permissions will be used to enable the add-ons functions—like identifying links and previewing them, for example—but if you’re not comfortable with this level of access, get rid of the extension. Mozilla has a good guide to weighing the trustworthiness of an extension here. Essentially, you need to look for brands and developers you trust, and look for how popular and well-reviewed an add-on is. One option for blocking extension access to your data on a temporary basis is to use your browser’s incognito or private mode. This is only a choice if you use Chrome or Edge though, where add-ons can be enabled or disabled in private mode—in Firefox and Safari, your add-ons run as normal. Below you’ll find an explanation of how to review and audit all the extensions you’ve installed in your browser. Again, we’d recommend keeping the number of installed add-ons down to a minimum—even good extensions can get hijacked or exposed if the developers aren’t careful. 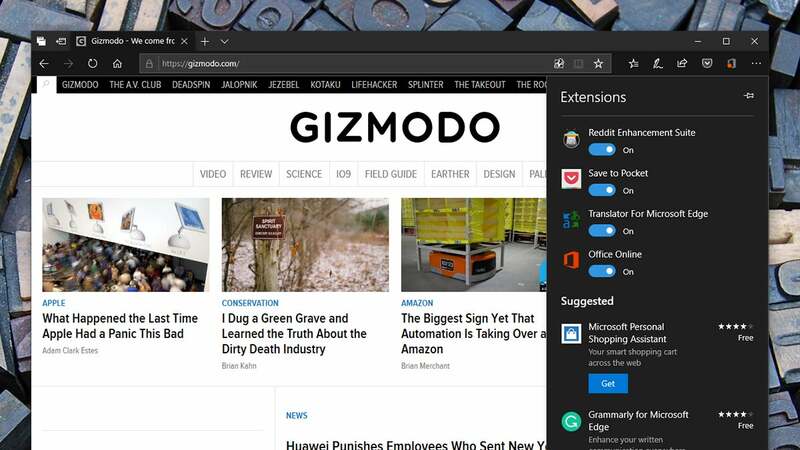 To get at your extensions in Chrome, click the menu button (three dots to the top right) then choose More tools and Extensions. If you want to disable any of the add-ons you see, just turn the relevant toggle switch off. 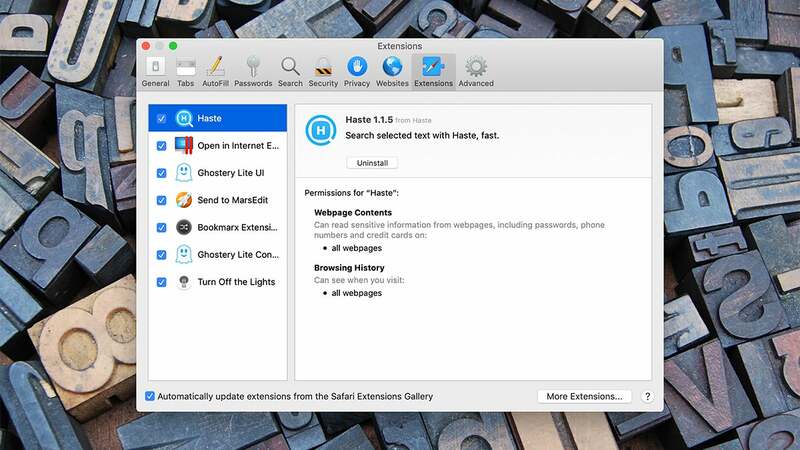 Each of the extensions should be accompanied by a little description, but if you want to know more about what a plug-in can and can’t do, click the Details button. The permissions the extension has, plus a few other details are listed. In some cases you can modify permission access using the Allow this extension... drop-down menu as well. Set the option to On all sites to let the extension work everywhere, or to On click to get it to ask permission for each new site you visit. Pick On specific sites and the extension can only read and change data on the sites you list—click Add to enter new URLs. The same screen lets you set whether or not extensions are allowed to run in Chrome’s incognito mode, and lets you remove them completely from the browser by clicking Remove extension and then Remove. The extensions page in Firefox can be found by clicking the menu button (three lines, top right), then Add-ons then Extensions. Temporarily disabling a particular add-on is easy enough, because you can just click the Disable button. You can click any entry in the list to see more info about it, but this info doesn’t include the permissions the extension has—instead these are listed on the confirmation box that appears when you initially install the plug-in. You can also view an extension’s permissions in its listing in the Firefox Add-ons directory. There’s no way to tweak these permissions or restrict them for the time being—you either agree to them or don’t use the extension. Mozilla has provided a detailed explanation of what each permission means, which you can find here. Some add-ons will have an Options button next to them, but this is for configuring the add-on’s functionality rather than changing any privacy or security settings. To clean an extension out of Firefox, click the Remove button. If Apple Safari is your browser of choice on macOS, you need to open the Safari menu and choose Preferences, then open up the Extensions tab to see what’s already been added. Click on any entry in the list to see its details. 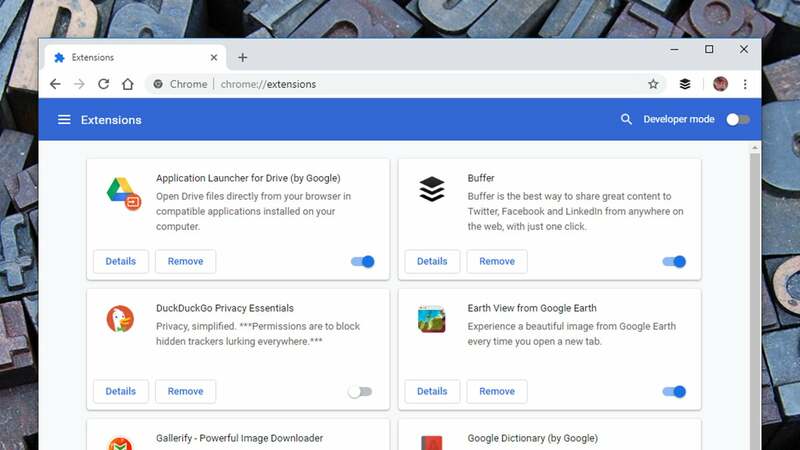 These details include the permissions the browser extension has, whether it’s reading the content of webpages you open up, accessing your browsing history, or whatever. There’s no way to tweak these permissions—if you don’t like them, you need to click Uninstall to get rid of the add-on. You can, however, temporarily disable a particular extension by unticking its entry in the list. If you don’t want an extension watching what you’re doing for a while, this is perhaps the easiest way to go about it (in Safari, extensions are still active in private mode). 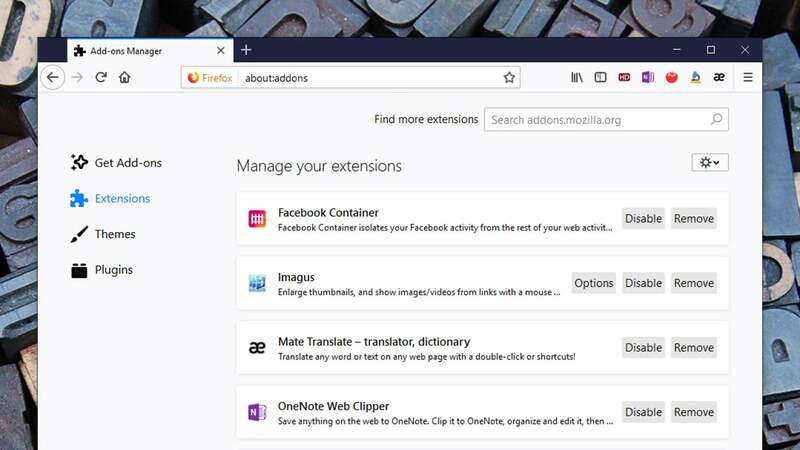 Edge extensions have been around for a much shorter time than the other browsers, but you can see the ones you’ve got installed by opening up the application menu (three dots, top right) and choosing Extensions. Temporarily disabling an extension is easy enough: Just turn the relevant toggle switch off. The add-on no longer appears or works in Edge, but can be brought back again instantly using the same toggle switch. Click the cog icon next to any extension to see the permissions it has (these same permissions also appear in a pop-up confirmation window whenever you install an extension). You can’t edit these permissions or where they’re applied, but they’re easy enough to review. The same screen might have a few other options you can turn on or off (like whether or not the extension can show notifications). 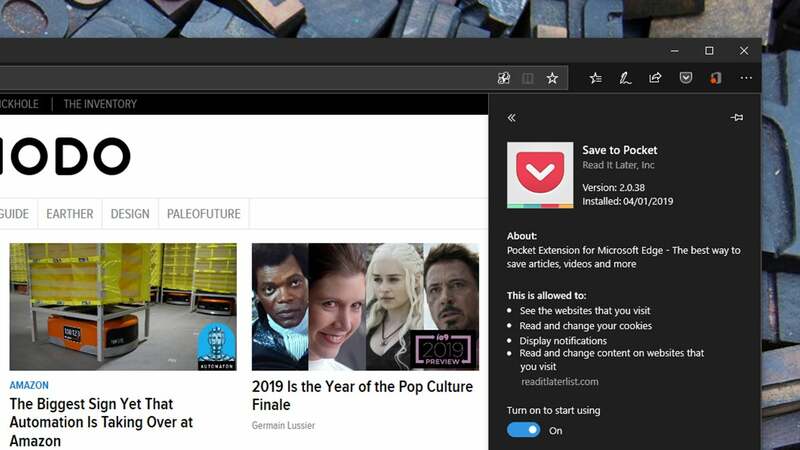 If you want to get rid of an extension from Edge completely, click the Uninstall button.